If you’re reading this as a musician, artist or producer that has produced music ready to roll out to the world then first and foremost, congratulations! You’ve already completed most of the hard work – moving towards actually selling your music is probably simpler than you think. It’s only up from here! This guide will show you 5 different ways how to upload to Spotify to help you get selling your music on the best streaming platform in the world. As you probably realize, the days of physical sales and distribution have been pretty much swallowed up by digital music sales. That’s not to say that people never buy CDs or physical music, though. Vinyl especially has resurged hugely lately, but, step 1 to getting your foot on the ladder is to distribute your music to streaming platforms. In short, streaming largely revolve around Spotify and Apple Music, but there many smaller platforms and others like Pandora which are growing fast. On balance, Spotify is still the biggest of the big streaming services – it should be your first port-of-call when you want to take your music sales to a new level and start actually earning cash! Spotify has the most opportunities for new and developing artists, it has the youngest audience and it’s the most well-known brand for music streaming worldwide. How Do You Upload to Spotify? Spotify allows for integration many user’s playlists, it has a unique UI that displays trending tunes, it’s highly integrated with social media features like Instagram’s stories and it categorizes tunes pretty much perfectly to make sure they’re easily searchable by users. 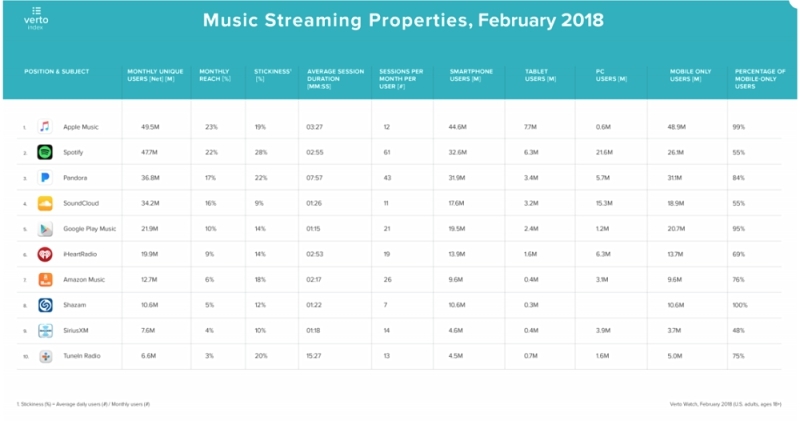 Image: https://www.digitaltrends.com/music/best-music-streaming-services/: Despite the stats on Apple Music, as you can see, Spotify still tops this list from Digital Trends concerning the best streaming platforms. So now that’s settled, what about uploading your music to Spotify? Think it’s an easy process? Unfortunately, it could be easier! But don’t worry, read on and soon you’ll know precisely how to go about digital distribution. Back in the day, you’d rely on a label signing your music and then distributing it to record stores and shops. By tracking barcodes and therefore sales, the label would collect royalties and record sales and forward them to you. The alternative to getting signed was to sell music independently. Now, this is all actually quite similar BUT instead of dealing your records to brick-and-mortar stores you’re dealing them to DSPs – Digital Service Providers, which are also known as Digital Music Distributors. These DSPs then push your music to many streaming networks for you. 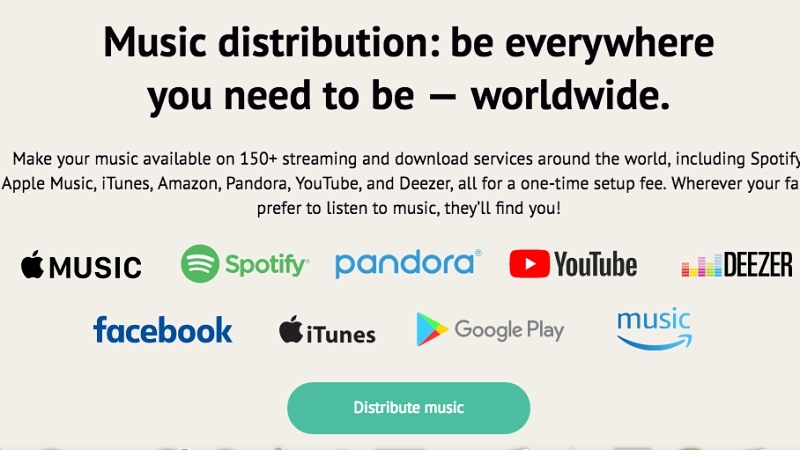 A DSP or Digital Music Distributor organizes the tracks from hundreds of thousands of individual musicians and then communicates with streaming services to get your music hosted. They track all of your sales, your plays, and your money and then pay you your royalties into account from which you can withdraw it. In short, you can’t go round to every streaming site and just upload your music yourself (like you can with SoundCloud). You need a DSP to distribute your music to them on your behalf. In exchange, you usually have to pay a fee but you will have the chance to monetize your music across these massive networks. Without DSPs, you’d have to upload your music to every streaming provider individually. These streaming providers would then have to check you and your music, pay you into personal accounts, etc, etc – it’d be an unimaginably arduous process. Can I Still Sell Directly to my Fans if I use a Distributor? Yep, selling music via SoundCloud, Bandcamp or directly from your social media or website is called D2F sales – Direct to Fans. You can combine these methods with most distributors. However, you’re really limiting your scope by selling purely with D2F methods. Your artist page won’t be hosted across streaming sites. In short, you’re not losing out by using DSPs. DSPs are actually extremely convenient for musicians and they’ve opened exciting opportunities for musicians in the 21st century. Digital distributors essentially allow you as an independent artist. For example. if you want to change musical direction then a label might have a problem with that, but not a DSP. You have to pay a fee to DSPs to use them. Sometimes, there will be no monthly fee – you’ll just pay a cut when your tracks are sold. More often, though, you’ll have to pay on a renewing basis. Aside from paying, you won’t have to do much to prepare yourself to use a DSP. Some DSPs operate on an invitation-only basis but most have an application-based screening process or no process at all other than basic copyright and plagiarism checks. Of the DSPs that do screen your music, some are more liberal than others, for example, some DSPs promote select music through their own marketing channels, e.g. by posting your profile on their social media and these will most likely check your music. 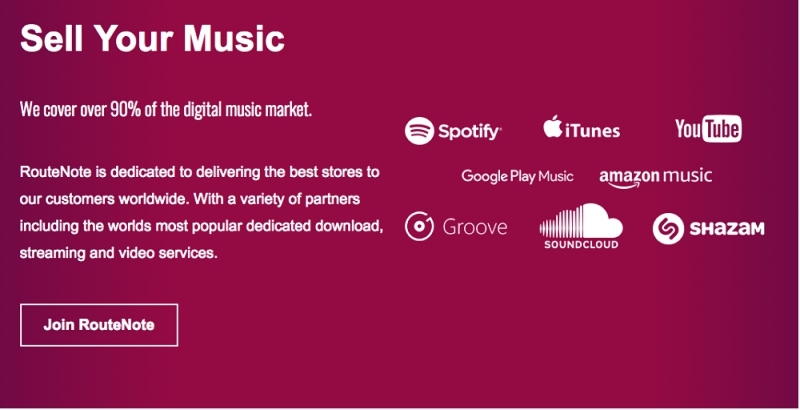 Lastly, whilst this list focuses on Spotify, most, if not all of these DSPs work with other streaming services like Pandora, Apple Music, etc. TuneCore has been around for some time and they’re certainly one of the more well known DSPs. Their fee system is cheap and with a variety of extra options, they offer more on the whole than many other cheap DSPs. You can access Apple analysis tools and trend report, you get a free embeddable media player and extra paid services allow for you to request that your tune is checked, edited or even mastered by professionals. Finally, they offer a promotion system where you can pay discounted fees for radio plays and other forms of marketing. 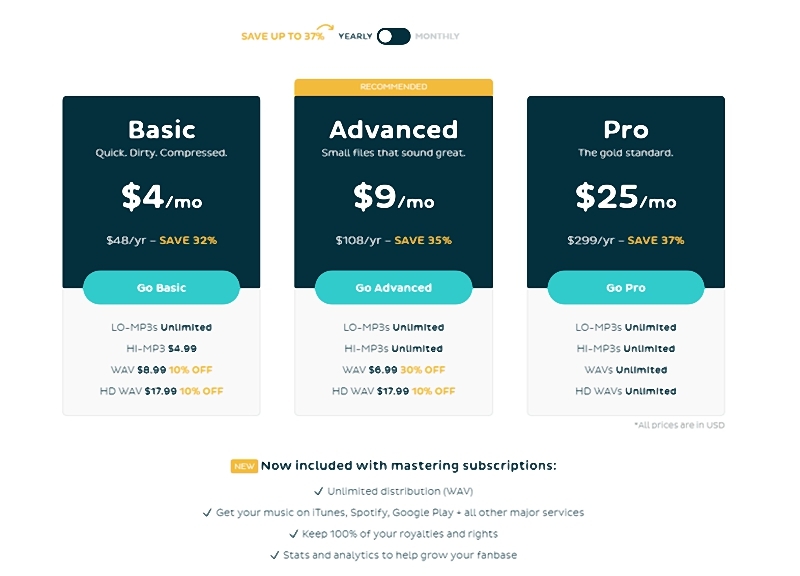 TuneCore’s pricing plan is fair but it’s not as cheap as other DSPs. They ask for $9.99 for a single or $29.99 for an album but you’ll have to renew these each year and for an album, the renewal price is $49.99. That basically means you’ll need to see some relatively significant sales to turn a profit. Of course, if you’re turning over a large sum then it won’t be a problem. LANDR started off life as a mastering service but now offer themselves as a DSP with a great foothold in the digital music world. LANDR integrates its mastering software with its DSP, allowing you to master your music with the service prior to upload. If you choose a mastering package then distribution will be included in the cost. Alternatively, you can pay for packages between $1 for distributing low-quality MP3s or $3 for normal quality. However, the best value is when you’re also using the mastering service, as shown in the above image. LANDR’s interface allows for seamless integration with their mastering service which makes the whole prep + upload process extremely easy. It’s a high-tech site, sleekly designed and bulletproof in its UI and artist interface. Standing for “Artists Without A Label” AWAL essentially provides both a DSP and label-like services for a 15% cut of any royalties paid. Their business model is quite unique and with a super-cool web interface and tons of trending acts under their wing, they’ve become a massive player for musicians worldwide. AWAL has a selection process but it’s not too stringent and they won’t mind what genre you produce. 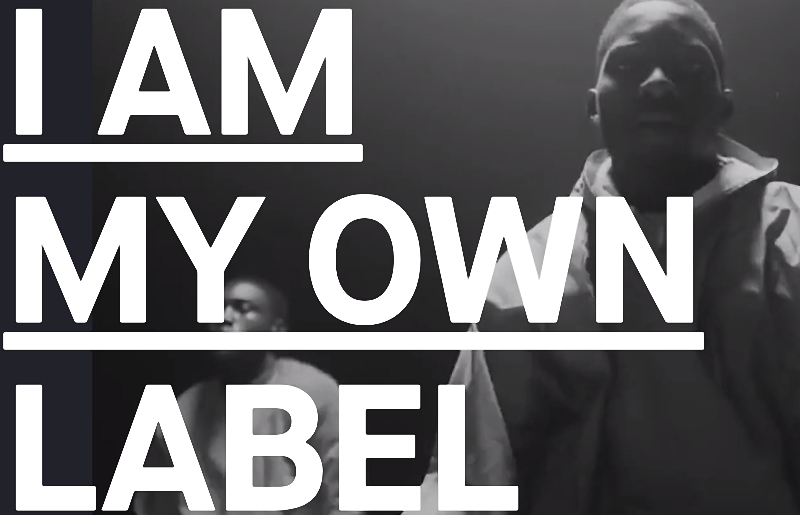 AWAL are well known for their promo campaigns, they can help you market and promote your music in a similar way to a label. Amongst their promo techniques, they run playlists across social media. Lastly, there’s a chance AWAL will contact you to help fund and promote your music through their A&R team! In return for this, you’ll have to part with 15% of all royalties. RouteNote has risen to the forefront of the more liberal and cost-effective DSPs. RouteNote is free to use – they only charge on a commission basis. You receive 85% of the profits from royalties and track uses. At any time, you can pay an extra fee to upgrade your account to receive 100% of your royalties going forward. RouteNote has been really well received by the community and it’s trusted by users and reviewers. The flexibility of RouteNote is class-leading as it allows you to follow monetize some songs totally by paying the fee whilst leaving other tunes collecting just 85%. They lack some advanced extra features and they don’t offer many opportunities for marketing and promoting your tune but in terms of the DSP basics, they’re transparent, cheap and bullet-proof in terms of security and integrity. CDBaby was an original CD manufacturer and distributor that provided records en-masse to shops worldwide. They still do that but in the digital world, they’ve taken a massive leap forward to offer digital distribution services. For their basic fees of $9.95 per single and $29 per album (no yearly renewal required), CDBaby offers the usual distribution services across all major streaming services, a YouTube monetization plan and the chance to have CDBaby manufacture and distribute CDs. Their advanced packages are focussed on collecting advanced royalties from Performing Rights Organizations and similar. The wonderful world of DSPs is quite dense and there’s a lot to learn here but the process of getting your music into the streaming world is actually quite straightforward. DSPs are invaluable for artists, they simplify the process of hosting, distributing and publishing your music. Choosing the best DSP is pretty much impossible. The standard is high and the days where DSPs would pull of dodgy copyright tactics are largely over. All of these DSPs are reputable and well-known for their solid services. Broadly, though, RouteNote is great for those who have just got to the point of releasing their music. If you want to take a minimalist approach and test the waters then they offer a no-nonsense service. For those looking to get involved with extra services, AWAL is cutting-edge and they’ve disrupted the DSP industry with some cool new and innovative features. CDBaby is a tried-and-tested veteran and with their transparent service offerings, they’re totally secure and aren’t likely to go anywhere any time soon. TuneCore is one of the most famous distributors and it’s no wonder that they provide tons of extra features for new and aspiring artists. LANDR, finally, is perfect for those who enjoy their cheap revolutionary mastering service. The choice is yours – good luck!